The erosion problems of the Ganga-Padma has remained a problem for a long time. The matter was taken up by Govt and a Committee was appointed to study the causes of erosion and come out with solutions and a very valuable report was produced by Shri Pritam Singh. The State Govt. approached the Govt. of India with expectation that the severity of the erosion will be realised and after continuous persuasion, it ultimately yielded result. The erosion problems in the districts of Malda and Murshidabad are now perceived as problems of National dimension. The latest study of the problem was done by Keskar Committee, appointed by Planning Commission. They identified problem areas and suggested priority of works, which have been executed by the State Govt. The State Govt. 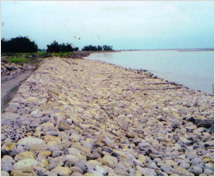 has also taken up some more anti-erosion works in Ganga-Padma downstream of Farakka Barrage in the district of Murshidabad with the fund awarded by 10th and 11th Finance Commissions. A CS (Centrally Sponsored) Scheme on the acute erosion problems identified by the G.N. Murthy committee is also under execution. Very recently the protection works of Jalangi area has given desired result. 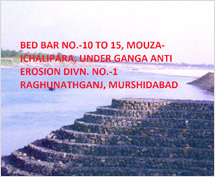 The problem of Ganga-Padma erosion at Akherigunj has been taken up with top most priority. 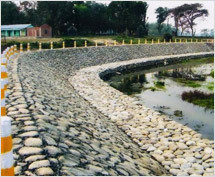 The Department in past 25 years has executed quite a number of anti-erosion works in the North Bengal River System in the districts of Cooch Behar, Jalpaiguri and Darjeeling. 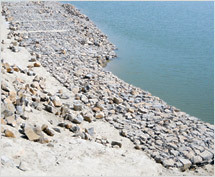 The anti-erosion works in the Bhagirathi-Hooghly System with all its tributaries have been taken up in quite a number of places. Special mention has to be made in respect of Flood Management works in the district of Malda. The Ganga upstream of Farakka Barrage is creating problem in two ways. There is a continuous swing of the river to left and thereby a huge chunk of land is eroded away every year. Along with this, the flood of Ganga basin as a whole passes through this barrage and it spreads in a wide area on the upstream. To counter act these two problems, the State Govt. has to take up both construction of retired embankments and protect this embankment with boulder masonry works with falling apron. 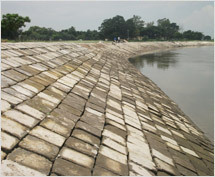 The retired embankments are rebuilt after they are eroded by Ganga. 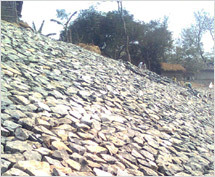 The 8th retired embankment has been completed to avert flood in Malda district.